Its more than a pile of old stones……………. The Revd. Edward Duke was the first person to associate astronomy with Stonehenge, describing it as a planetarium full of significant astronomical alignments – although he named none. Unfortunately most of his ideas on the subject were rather fanciful and over-imaginative, and not very scientific. Sir Norman Lockyer (1836 – 1920) was the first person to identify the reason for the orientation of Stonehenge. He realised that on the summer solstice the sun rose at the end of the main axis (as it would have done in the second and third millenniums BC). He published these findings in a book in 1906. However, Lockyer made many errors and incorrect assumptions, which made archaeologists suspicious of the possibility of astronomical alignments. Therefore, it was not until the second half of the 20th Century that astro-archaeology became a major science in its own right. Gerald Hawkins, an American astronomer, published the results of an intense study of Stonehenge’s astronomical alignments in Nature in 1963. In the article he described how he had used a computer to prove that alignments between Stonehenge and 12 major solar and lunar events was extremely unlikely to have been a coincidence (Castleden, 1993). 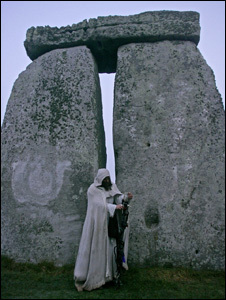 His book, Stonehenge Decoded, containing the fully developed theory, appeared in Britain in 1966. He described how he had found astronomical alignments among 165 points of Stonehenge associated purely with the Sun and the Moon, and not with any stars or the five naked-eye planets (Mercury, Venus, Mars, Jupiter and Saturn). He discovered that lunar eclipses could be predicted through a system of moving stones around the circle of Aubrey Holes. Controversially, he went on to suggest that Stonehenge was an ancient computer. The 1960’s were still early in the computer revolution, and the Harvard-Smithsonian IBM had produced some fantastic results for him. This was merely Hawkins’ way of paying a high compliment to the architects and builders of Stonehenge (Castleden, 1993). There are indeed a large number of astronomical alignments, prediction and measuring devices, and representative features to be found among the megalithic stones and holes of Stonehenge. Gerald Hawkins discovered many of them, and most of his discoveries are commonly accepted. In his booklet, Postins states that the five trilithons represented the planets visible with the naked eye. Mercury and Venus are the two planets in the sky that keep in closest association with the Sun. The eastern and northern lowest trilithons have alignments through the sarsen circle relating directly to the Sun (see Figure 1). Therefore, Postins suggested that these two lowest trilithons represented Mercury and Venus. The two intermediate trilithons represented Mars and Jupiter because they are associated with lunar alignments. Mars and Jupiter are associated with the Moon due to their paths through the Zodiac. Because of this they are not linked to sunrise and sunset events like Mercury and Venus, but may be observed close to the Moon as they all follow similar paths along the ecliptic. The two intermediate trilithons align with major and minor positions of the Moon, which the Altar Stone (stone 80) also does through gaps in the sarsen circle (see Figure 1). The Great trilithon represented Saturn because Saturn moves very slowly across the sky compared to the other four planets. This stately pace may have indicated to the people who built Stonehenge that Saturn held some sort of ‘senior’ position in the heavens. The Sun-aligned low trilithons cannot be differentiated in order to determine which planet (Mercury or Venus) each represents. The same problem exists with the Moon-aligned intermediate trilithons representing Mars and Jupiter. Postins speculates that there could have been carvings on the trilithons, now long eroded from existence, which indicated which trilithon represented which planet. All of the astronomical alignments within the sarsen circle are present in older parts of the monument, including the Station Stones, Heel Stone and the numerous holes and posts. See Figure 2, which illustrates all of the astronomical alignments among the features of Stonehenge. The alignments are extremely precise, which illustrates the high level of knowledge possessed by the builders of Stonehenge. Such knowledge must have been gathered over decades or centuries of observations of the sky (during which the behaviour and interaction of the heavenly bodies was noted), before the idea of Stonehenge was even conceived. The four Station Stones (SS), 91, 92, 93 and 94 formed a perfect rectangle, which is remarkable considering that the long axis of the rectangle is around 300 ft in length. The sarsen ring formed a circle 97 ½ ft across in which every upright was, on average, less than 3 inches out of position! This geometric precision was investigated in around three hundred megalithic monuments all over Britain by Alexander Thom. He deliberately investigated large numbers of megalithic monuments prior to visiting Stonehenge (in 1973) in order to prevent obtaining a biased view. It would have been easy to see Stonehenge as the perfect example of a Megalithic monument and then proceed to examine other monuments with this assumption in mind. During his study of these monuments he came across two standard units of measurement, which he called the ‘Megalithic Fathom’ (equivalent to 1.6 m or 5.44 ft) and the ‘Megalithic Yard’ (equivalent to 0.83 m or 2.72 ft – 8 ½ inches short of a standard English yard). Thom found that the Megalithic Yard had been used at Stonehenge, in the spacing and positioning on the sarsen circle uprights. With these commonly recognised units, it is understandable how the Neolithic peoples that built Stonehenge achieved such a level of precision – and hence produce a very accurate astronomical observatory. Figure 2, below, illustrates the many alignments among the stones of Stonehenge I and Stonehenge III. Figure 2 shows that an observer looking from SS92 (Station Stone 92) over SS91 would see the summer solstice sunrise, as he would if standing behind the Altar Stone (stone 80) and looking over stones C and B in the Avenue, just to the left of the remaining Heel Stone. Many of the alignments are at exact right angles. This is due to latitude at which Stonehenge was built. The exact rectangle of alignments through the Station Stones can only be achieved on (or very close to) 51° North. Once again, this demonstrates the astronomical knowledge the Neolithic populations possessed. Consisting of 19 stones, the bluestone horseshoe (just inside the 5 sarsen trilithons) had a couple of possible uses. It could also be used to follow the nodal cycle of the Moon, which has a period of 18.61 years. The extremes of the Moon’s position on the horizon are marked on Figure 1, with the two intermediate trilithons and stones 8, 9, 10, and 20, 21, 22 of the sarsen circle. This means that to predict an eclipse, 223 full Moons must be counted before the Earth, Moon and Sun are again in the same positions as at the beginning of that time. This period of time is called the Saros, and it is possible that Stonehenge III people discovered it. However, not all eclipses would be predicted by this method of counting the bluestones in the horseshoe because eclipses occur quite frequently, except with slightly different positions of the Earth, Moon and Sun. Gerald Hawkins’ theory on the use of the 56 Aubrey Holes to predict lunar events was workable but imprecise. At intervals of 9, 9, 10, 9, 9, 10, you could place 6 alternately black and white marker stones around the Aubrey Hole (AH) circle, and move them clockwise or anti-clockwise around the ring one hole per year. (Castleden, 1993.) Aubrey Holes 51, 56 and 5 were fixed markers. See Figure 3 below, which illustrates the concept. Hawkins successfully demonstrated that several important lunar alignments occurred in 1549 BC. He suggested that the astronomers at Stonehenge knew these alignments would take place when a white marker arrived at AH51 that year. Eclipses of the Moon occur every 18.61 years. The reason why there are 56 Aubrey Holes is because 18.61 x 3 = 55.83 (or 56 to the nearest integer). Eclipses of the Moon in summer or winter took place when any marker stone arrived at AH56 or AH28, the two holes that lie on the main axis of Stonehenge. When a white marker reached AH5 or AH51, equinox eclipses would occur. There are 30 uprights in the sarsen circle. A full Moon occurs every 29.53 days. A seventh marker stone (a Moon marker, shown in Figure 3) would be moved once a day around the sarsen circle to keep track of the phases of the Moon. In the 1960’s many British Stonehenge archaeologists were frustrated that an American astronomer had determined the reasoning behind the monument’s structure, having barely laid a foot in Stonehenge! As Hawkins’ highly plausible ideas went down badly in the British archaeological circles, Glyn Daniel (the editor of Antiquity) sought assistance from Fred Hoyle, the current Professor of Astronomy at Cambridge University. Hoyle studied Hawkins’ work, and produced his own theories on lunar predictions using Stonehenge. In his scenario, Stonehenge became a Solar System model with Earth at the centre. Rather than seven stones, Hoyle chose 3 stones representing the Sun, Moon, and one node of the Moon’s orbit. The 3 stones were moved around the Aubrey Hole ring at their real rates relative to each other. When the 3 markers lay close together or almost opposite each other, eclipse seasons took place. Actual eclipses occurred in these seasons only when the Moon stone moved close to the Sun stone, or was diametrically opposed to it (i.e. precisely on the opposite side of the Aubrey Hole ring). Hoyle’s method is much more accurate than Hawkins’ because the actual day of the eclipse was predicted, as well as the eclipse season. It is also much simpler to operate on the ground. Even after Hoyle’s more rational efforts, many archaeologists remained unconvinced. Today it is regarded as remarkable that Hawkins’ eclipse prediction method was seen as such an impressive step towards understanding parts of Stonehenge. It is believed that his use of the Harvard-Smithsonian IBM computer made his theory ‘infallible’ at the time. After all, it is highly unlikely that even the people of Stonehenge I would have been satisfied knowing only the year in which an eclipse would occur!